Dr Ben Carson published a book called “Take the Risk” in 2008 in which he discusses how he decides whether to do risky surgeries or not. In many cases his approach to risk taking in surgery is very applicable for business scenarios. I have used this approach in several situations and it usually helps bring clarity to whether or not our fears of the worst case situation if we take a risk are merited or not. I am heavily borrowing from his text here, so if this approach helps you out, you should purchase the book and learn more about this fascinating view of risk. What’s the best thing that could happen if we take the risk? What’s the worst thing that could happen if we take the risk? What’s the best thing that could happen if we don’t take the risk? What’s the worst thing that could happen if we don’t take the risk? That’s it, just those four questions can shed a lot of light on what you’re doing. 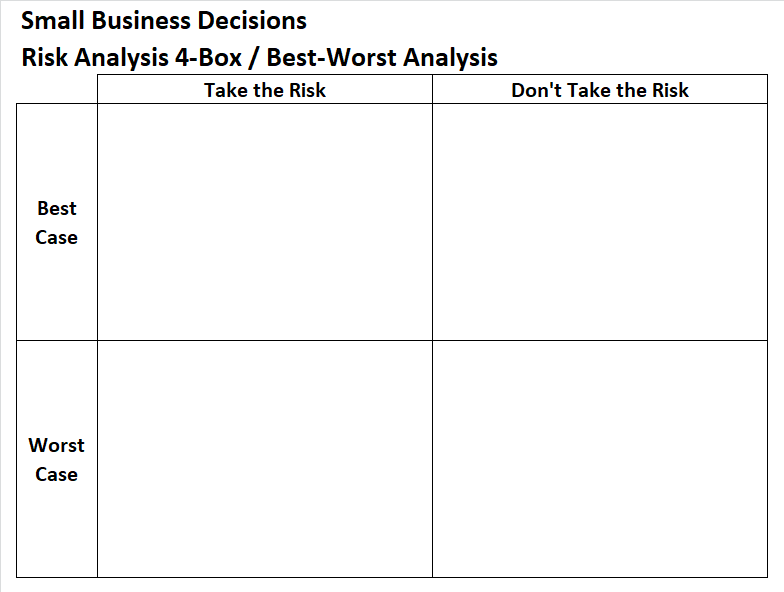 I have created a 4-box with these and put many life decisions into that 4-box. In almost every situation it has shed clarity. That’s it, not much more to put here. if you want to read through examples and get a better feel for how to use this please try it out. It may seem too simple, but often you’ll find that the worst case scenario when you try something out is not much different than the best case scenario if you don’t try it out. To Start or Not to Start a Business? My personal Best-Worst analysis for leaving my corporate job and starting a business. Now, let’s keep in mind some assumptions here. I left my corporate job on GREAT terms. No bridge burning, lots of people always asking if I would come and work for them or take on special projects. I have excellent chances and connections that will allow me to limit my risk if business doesn’t’ take off and I eventually run out of savings. Pretty nice post. I just arrived after your blog and wished to admit I actually have really enjoyed surfing your blog posts. Following all I am subscribing to your rss feed and i also hope you write again soon!